The recent deal between US-Saudi arms agreement has buzzed around global political landscape and media. The U.S President Donald Trump visited Saudi Arabia on May 20th, 2017. KSA (Kingdom of Saudi Arabia) has been the traditional U.S ally since the time of Cold War. He signed for sales of arms deal net worth around $110 billion. It has been estimated that over the decade, the deal will produce around 350$ billion. Saudi also has shown interest to invest billions of dollars in U.S in exchange. Most of the decisions were aimed at pleasing Trump. The deal has been, “the greatest single arms deal in the US history” as the statement issued by the White House. The purpose of the deal could also be taken as to increase the GDP of the US with the selling of arms and equipment. According to Forbes in 2016, KSA is the world’s largest weapons buyer, with fourth-largest defence budget in the world. Saudi Arabia’s government purpose is to increase the defence capabilities, bolstering the equipment’s and services, which in future preparing KSA against possible geopolitical tussles in the region. While $28 billion worth of integrated air and missile defense, combat ship, tactical aircraft and rotary wing technologies and programs and equipment such as aerostats, tanks, artillery, counter-mortar radars, armored personnel carriers and helicopters have also been dealt.US will also be likely to provide training to KSA ground force. The deal will also help in upgrading the KSA Naval and air force. Naval force will have Multi-mission Surface Combatant Ships, Helicopters, Patrol boats and other associated weapons systems. KSA Air Force will also receive some few upgrades that include Transport, Light close air support, Intelligence-gathering aircraft. 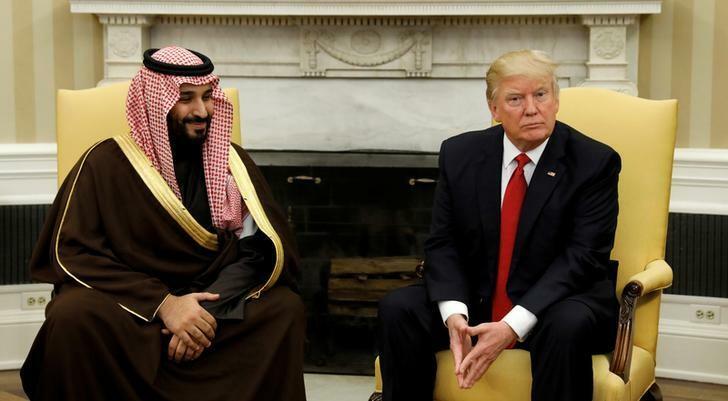 This deal might have been profitable for the both parties as Trump Administration had its strategic interest for the Middle-East visit and KSA has its own interest in the region. It has expected to create the huge number of jobs for US firms and in KSA. This deal has shocked few Senators from the US are and they were strongly concerned about it. Senators like Democrats Chris Murphy and Republican Rand Paul and Al Franken has urged to his colleagues for disapproval in the Senate for a vote to block the part of the sale. Once Congress is formally notified of plans, The Arms Export Control Act of 1976 allows the senator to force a vote on and arms sale or deal. According to Senator Ryan Paul in a statement “Saudi Arabs past support in terrorism, poor human rights record and methods used in its war in Yemen, Congress must carefully consider and thoroughly discuss if selling them billions of dollars of arms is in our best national security interest at this time.” Members belonging to both Republican Party and rival Democrats are expecting to block the sale of weapon and equipment. Human rights organisations are also unsatisfied with this deal. Amnesty International also showed strong concern over arms deal and urged the US to respect Global Human Rights. This deal could have negative outcomes in neighbouring countries like Yemen because Saudi Arabia is attacking the Ansar Allah group, that group which has proved its skilled in beating back Al Qaeda in the Arabian Peninsula. Saudi Arabia in collaboration with its ally is running its military strikes against Houthi rebels which are led by Shia Muslim. The war in Yemen has grown concern for an international community as the war has increased the numbers of immigrants and is forced to flee to Libya and Nigeria which have grown the chances of human trafficking and human rights violation. This $110 billion worth of weapons will neither lift the burden of American military nor might it support the long-term security of Saudi Arabia, as the State Department argues. In the 1980s when Saudi spent such huge amount of money to then Iraqi dictator Saddam Hussein to arm his war of aggression against Iran which has not brought good results in the world today. President Trump’s visit to the Middle East was supposed to create an environment of peace and to think about ways to end the war in the Middle East by bringing Iran and Saudi Arabia to dialogue to solve the issue of Syria. Selling these huge and “beautiful weapons” do not bring peace in that region. Dreaming of peace by selling such weapons which have the capacity of heavy mass destruction is only a foolish dream. This deal might create a huge number of jobs for both countries but peace and stability are more important in today’s world. Nepali Young on IR article series #1. By Samaya Lama and Sunil Limbu, representing Nepali Young on IR group of Garjan-Nepal. ‹ Civil society’s hidden power: firsthand experience from the United Nations Human Rights Council	› Refugee crisis: a game of politics?